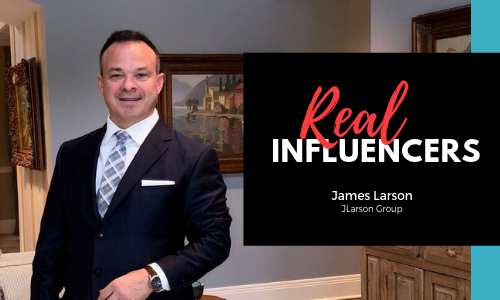 Luxury broker James Larson takes an advisory approach to assisting clients with the buying and selling of properties in the Chicagoland area and Wisconsin. His goal: to build lasting relationships that have clients returning to him, time and again, to find homes that accommodate each phase of their lives. Larson is quick to talk clients out of a home that is wrong for them, knowing that finding the right one is worth the wait. It’s what sets his brokerage apart from the numbers-driven competition, who are more concerned with sales volume and quick turnaround times. It also allows him to focus on challenging properties, such as a $2.5 million, 100- acre Equestrian Estate in Bristol, Wis., located in a market where the average home is around $200,000. To sell a home like that, he considers all its potential uses, and determines the most likely buyers — commercial and residential, on a national and international level — and markets to those audiences. This strategy resulted in a plastic surgeon from Milwaukee inquiring about using the property as a retreat for patients recovering from surgery. “A client of mine is a client for life,” Larson says. He keeps in touch with clients long after the sale, giving advice on home maintenance issues, keeping them up-to-date on property tax laws, and helping them to protect their investment and determine which home improvement projects will warrant a return. Larson lives in Glenview — a village where residents often move multiple times without leaving, a sure sign of a good investment — with his wife Audrey and their identical twin teenage sons, Jack and Charlie. Prior to his real estate career, which began in 2000, he was an aviation mechanic for 25 years. During that time, he and Audrey were adding condos to their investment portfolio, and were turned off by their agent’s disregard for their needs and insistence that every property was perfect for them. The experience motivated Larson to enter the real estate industry and make a difference. Chicago Agent spoke with Larson about his career and what focusing on the client, and not the sale, has taught him. Chicago Agent: What is unique about the way you run your business? James Larson: I never give someone a reason to lose faith in me. In many cases, a home is the single largest financial asset in a person’s life. The fact that they’d entrust that asset to me is an honor. CA: To what qualities do you attribute your success? JL: Tenacity and hard work. CA: When did you know you were going to be able to make a career as a real estate agent? JL: The minute I flipped my first investment. CA: What was the turning point in your career, when you knew you had “made it”? JL: When industry peers started to ask for my advice. CA: What is the best piece of advice anyone ever gave you? JL: Never allow yourself to be outworked. CA: What piece of advice can you offer new agents? JL: Be yourself. Don’t let anyone intimidate you. CA: Who’s your favorite business author or speaker? CA: What would you like to see change in the industry? JL: Less focus on awards and numbers, more focus on bringing real value to the table for the consumer. CA: What attracted you to a career in real estate? JL: It’s a “boots in the ground” type of business. I love the hunt. CA: What do you expect to happen in the real estate market next year? JL: We are going to see a leveling off in the market, and brokers are going to have to reevaluate their business models to meet the new norms. We also have a generation of techies entering the housing market. If you don’t adapt, you will be left in the dust.